The Compulsive Reader: Shiver Fans Rejoice, Linger Cover and Excerpt Revealed! Shiver Fans Rejoice, Linger Cover and Excerpt Revealed! Today, Maggie Stiefvater unveiled the cover art and the first few paragraphs of Linger, the sequel to her wonderfully amazing book Shiver. Check it out! Awesome, right? I can't say as I like it as much as I liked the Shiver cover, but I love the style, and the greens in it are gorgeous! Also, Shiver was really neat in that the entire book had cool blue touches throughout, making it fun to page through, so I'm eager to see a finished copy of Linger. Also, here are the first few paragraphs of Linger! Yay! I can't wait! What do you think will happen? 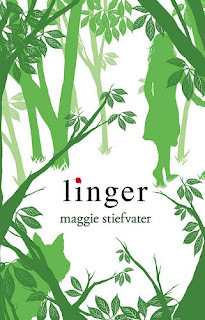 *squee* Can we really wait until next fall for Linger to come out? OMG! I cant wait to read this! I've been seeing this pop up all over the blogosphere and I absolutely love it! July 2010 is too far away! Oh my gosh!! This is so exciting! So she's becoming a wolf now?! How come she is changeing so late!?! ?